The Gibbs Quadski Does 45mph On Land Or Water | OhGizmo! This vehicle really looks like it should be in a Bond movie, or at the very least in some action flick with a spiffy chase. We think that being able to go 45mph on land or water, with nothing but a 4 second transition period gives the Gibbs Quadski some pretty serious cred. 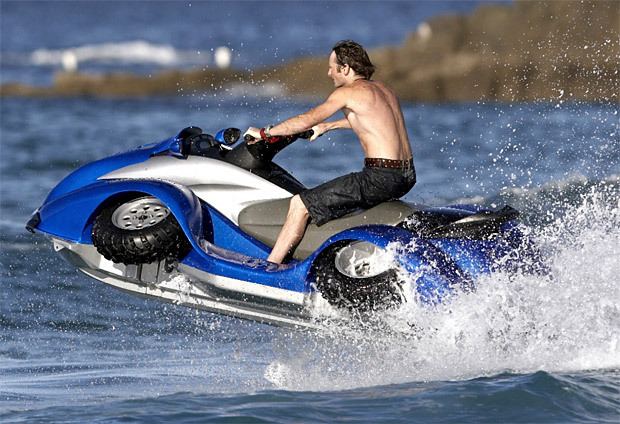 Powered by a BMW Motorrad K1300 engine, the Quadski is able to retract its wheels at the push of a button and give the rider the same level of performance in water than it does outside. Previous such vehicles have topped out at 10mph, which we agree is a ridiculous speed at which to have any kind of chase. Note however that as much as it looks like a AWD ride, it’s actually RWD. We’re not familiar enough with ATVs to know if that still qualifies it as a “quad”, but we’re not here to argue semantics. We can just tell you that if you want one, you’ll have to be ready to pay $40,000 when it goes on sale in November.